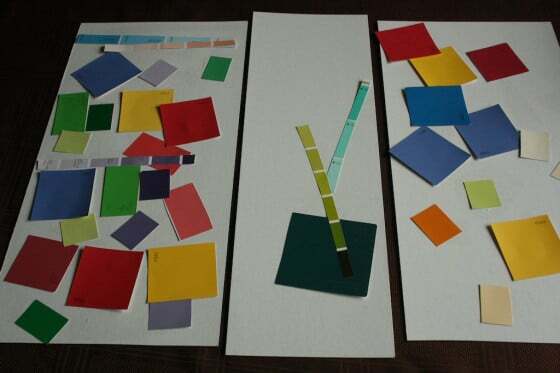 Paint Chip Mosaics – an abstract art project for toddlers and preschoolers! 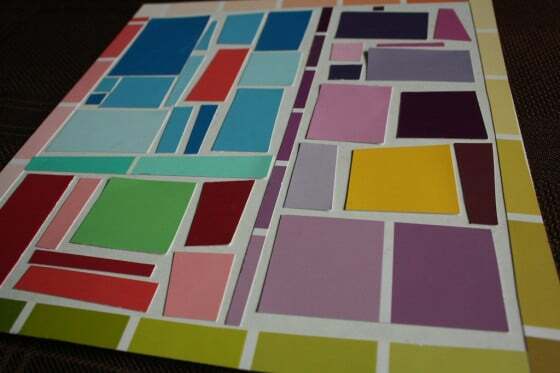 These paint chip mosaics were the perfect project for a day as grey and rainy as today . This morning, I set out some cardboard, a few glue sticks and a tray of paint chips that I’d cut up into squares, rectangles and strips. For older children, I would have them cut their own paint chips. In fact, now that I think about it, I’ll do the same here next time we do this project. The Hooligans love cutting along the lines in between the paint colours. 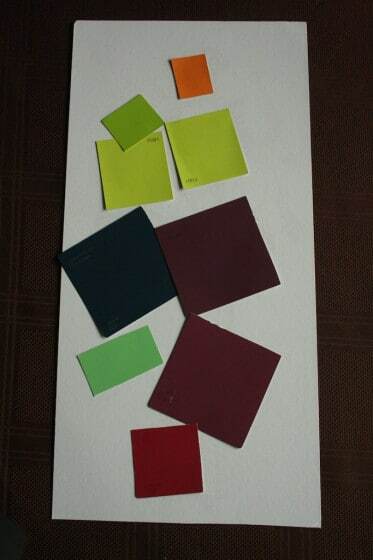 You can get paint chips, otherwise known as paint samples or paint swatches, anywhere that paint is sold. I generally grab a handful of samples every time I’m at the hardware store, but I always feel a little twinge of guilt knowing that I’m taking them to add to my craft stash, so I actually asked one time, at my local paint store, if they minded me taking some for my daycare kids to craft with, and the manager quite happily went to a drawer and grabbed about 20 unopened packages for me. Hey, it goes to show you, that it never hurts to ask! The Hooligans, being as young as they are, had a great time with this activity, simply sticking their paint chips in random fashion all over their cardboard. 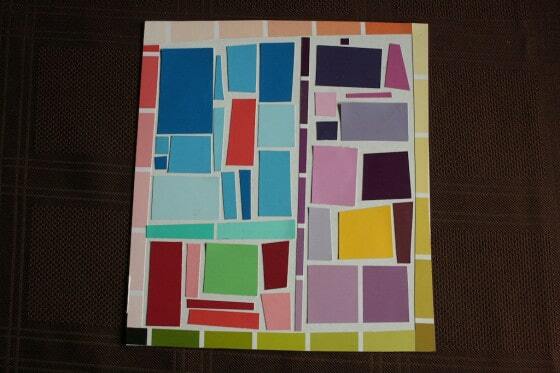 I worked on one of my own, using thin strips to make a frame, and gluing my paint chips in more of a mosaic pattern. 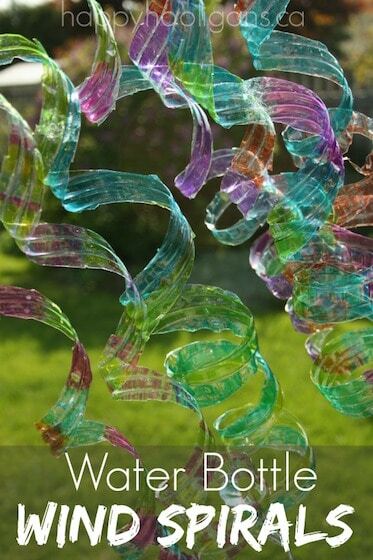 Mine will give you an idea of something that an older child could create. This is definitely a project that suitable for all ages of children. If you’re looking for another mosaic art idea for little hands, check out our Meat Tray Mosaics. They were really fun to make too! I love this Jackie!! These would be great in a frame! so fun!! 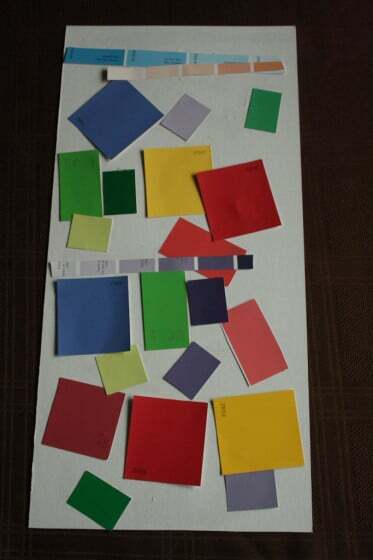 i love paint chips! and, just want to thank you for your kind words on my blog. i feel lost alot, and it was nice to hear from someone that i’m exactly where i’m supposed to be. very cool, my daughter is going to love doing this. I hope she enjoys it, Kirsty! I loved it! I probably had as much fun making mine as the hooligans had making theirs! LOVE this idea. I have a spinner of these chips that I can’t get rid of because you know how it is but couldn’t come up with the perfect idea. We’ll do this for sure. Thanks for sharing! 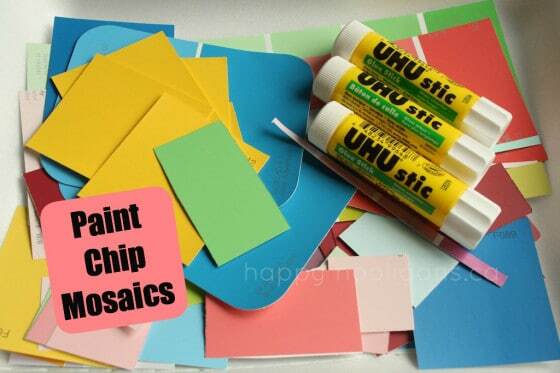 Great idea for using paint chips! And I love how they turned out!